The following review is straight from Operator Kean, a member of the Macro Ops Hub. To contact Kean, visit his website here. Lawrence Creatura recently shared his insights from over two decades of investing in markets. The following are my takeaways from Long & Short: Confessions of a Portfolio Manager. Prominent fund manager Bill Miller, who as the owner of the record for most consecutive years of outperformance against the S&P 500 is a person who knows something about kicking financial backsides, believes there are three sources of comparative advantage: 1) informational, 2) analytical, and 3) emotional. Informational advantages, or knowing something that the rest of the world doesn’t know, are wonderful to have but difficult to get. The first problem is that the ubiquity and velocity of today’s news leaves little room for trading. In the 1980s, academics estimated that after fresh news broke, price adjustments took anywhere from five minutes to two days. Today, prices begin to adjust in seconds, perhaps milliseconds. The other problem is that the government has taken a particularly keen interest in the use of material non-public information. Just ask Raj Rajaratnam. Be prepared to discuss how you came by the whispers of the bid for Bymeout Pharma. Analytical comparative advantage comes from having the same information as everyone else, but using it differently. This is the ability to come to a more correct conclusion, faster. You could have a stronger brain, or a stronger computer, or maybe you can spot the dissimilar jigsaw puzzle pieces that fit together after all, even though they didn’t seem to at first. Emotional comparative advantage is something else altogether. It comes from within, as your intellectual waters remain clam while others make poor decisions based on panic, greed, extrapolation, and faith. This advantage has more to do with how you are wired and is probably something that is very difficult to learn. Again, who are you? There are other comparative advantages. Perceptual. Cost. Patience. Speed. Network. Experience. It really doesn’t matter which is yours, but it is of existential importance that you have one. Otherwise you are entering the battle unarmed. Not CFAs or MBAs or even an online minor in Economics. They are very smart, can write to a deadline, and love a good metaphor if you can spare one. But they don’t do the math or even care about the math. They want the narrative, the plot, the story. They live in a verbal world where the numerical realities of a business event are secondary… Follow the media’s incentives. They are maximizing ratings, not returns. Their value-add is the rapid transmission of raw information. This is entertainment, not analysis. Ingredients, not the meal. Don’t use any media outlet’s conclusions, advice, or insights. There are two main ingredients for investment success: i) be different ii) be correct. This point is similar to what Howard Marks shared in his Oaktree Memos. You can’t hope to consistently outperform the market by investing alongside the consensus. As John Templeton once said, “If you want to have a better performance than the crowd, you must do things differently from the crowd.” However, being different is just a prerequisite. You also have to be correct while staying different. Different comes from within. It takes curiosity, reason, intellect, hustle, creativity, confidence, suspicion, the strength to be non-accepting, and a willingness to stand alone. Not a common combination of attributes. Also, being different is not enough. The second and final ingredient for investment success is to be correct. Being different and incorrect can be spectacularly disastrous: Oh, the humanity! … And how will you know if you’re correct? That’s the easy part. The market will let you know. In the pure search for investment return, academic degrees mean little. Yes, classroom training can give you some tools, but it is how you wield them that matters. There are certainly many examples where the exoskeleton of academic pedigree offered no protection from financial carnage. Roger Lowenstein’s book ‘When Genius Failed’ is a modern tragedy describing how an academic A-Team with degrees from Harvard, MIT, Stanford and University of Chicago, whose members including a Vice Chairman of the Federal Reserve, several professors, and two Novel Prize Laureates, (spoiler alert here)… failed. When you look at their portfolio just before its collapse, “genius” isn’t the first word that comes to mind: 25:1 leverage on just under $5 billion in equity, with $1.2 trillion (yes, trillion with a “t”) in notional derivative value off balance sheet. At the time, the firm’s implosion destabilized the entire global financial system. In contrast, look at the anti-heroes of another book, Michael Lewis’s ‘The Big Short’, which describes an unrelated gaggle of investors who successfully navigated the housing bubble. They included a one-eyed heavy metal fan with Asperger’s. Two guys who set up a hedge fund in their garage. An abrasive lawyer-turned-analyst-turned-manager. True, all of them had some level of academic training, but that wasn’t their currency. These were the outsiders, the investment industry’s equivalent of the ‘Star Wars’ bar scene. They were the handful, among the hundreds of thousands of professional investors, who spotted and executed the biggest trade of a generation. Beware taking shortcuts with social signals such as college degree, employment history, awards received, or fame in general. Also bury all of your preconceptions. You won’t be served well by believing the stereotype: the paunchy man with the “aw-shucks” southern drawl, the blonde with hair a bit too tall and heels a bit too high, the quiet new employee with pimples. You don’t want to be the one to find out, too late, that they are the smartest people in the room. Creatura points out that beyond basic knowledge like finance, accounting, and economics, many successful investors come from a background of varying disciplines (physics, engineering, mathematics, sociology, philosophy, literature, history, political science), suggesting that there isn’t an obligatory educational track. Instead, learn as much as possible about everything — “major in mankind”. Mosaic theory, the idea that an investment hypothesis is born from an array of disparate informational wellsprings, suggests that people with a broad knowledge base have an advantage. The best way to get this foundation is through reading. Reading can be a real chore for investment researchers. It is essentially what we are doing most of the day anyway, so the thought of cracking a book in your free time can be unappealing. But we all need as much of an edge as we can get, and broader perspective can be an actionable advantage. As Will Rogers observed: “There are three kinds of men. The one learns by reading. The few who learn by observation. The rest of them have to pee on the fence for themselves.” He was talking about electric fences. Most in this profession seem to lean toward nonfiction for their free-time reading. Biographies can teach you how the outliers of the human race think and solve problems. Books about events let you enter a different moment in time, draw analogies to today, and help you forecast what might happen next. Books that survey a phenomena through time (automobiles, interest rates, navigation, baseball, horticulture… the list is infinite) reveal the keys to process, advancement and improvement. Fiction won’t kill you either. Reading fiction gives you the ability to walk around in someone else’s shoes for a while… to become someone else with different emotions, desires, perceptions, biases, and motivations. The ability to see the world through others’ eyes is important in investing. After all, some of the questions you must answer are: Who will be the next buyer of your stock, at what price, and why? What is that next buyer looking for? What does she see? How does she feel? Of course you are reading a book right now, so some of the encouragement to read is wasted because you are obviously in the club already. Next time, however, consider reading something that is not about investing. Something wildly different. Something that expands your peripheral vision. It’s no walk in the park remembering everything we read. One way to organise and internalise the knowledge is by developing mental models. Here’s an interesting site that touches the subject. 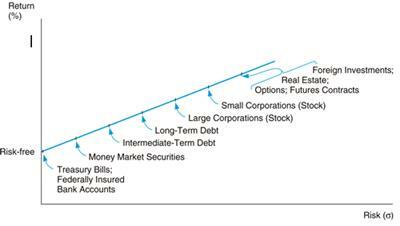 This is the finance industry’s current cosmology. The world is two dimensional (risk vs. return), equities are riskier than bonds, and both risk and return increase as company size decreases. Greater than 95% of investors believe all of this to be true. They are wrong. First, in the stock market, you do not have to take more risk to achieve more return. Heresy, you say? Look at the data for value stocks compared to growth stocks below. Geocentric finance is flawed. The reality is that value investing offers not only less risk but more return. This truth doesn’t fit neatly onto the diagonal risk/return line, but it is the truth nonetheless. Another bedrock, conventional belief depicted on this chart: stocks are riskier than bonds. This adequately describes most observations, just like the sun rotating around a fixed earth could describe the appearance of day and night. But it’s not that simple. Bonds have been on a 20-year run. Today, interest rates are near zero, and governments around the world have been unaimously printing currency to service existing debt. Are you certain those bonds are safe? Sure, nominally you are seeing less volatility. But what about the purchasing power of the yield stream? All of us have a collection of beliefs which we use to make decisions in a complex world. We need these intellectual shortcuts or we would never get anything done. When it comes to asset allocation, however, there are some gaping differences between how we think the world works and reality. Be careful what you believe. Overall, this book is a very light and easy read. I give it a 4 out of 5. To learn more about our investment strategy at Macro Ops, click here.